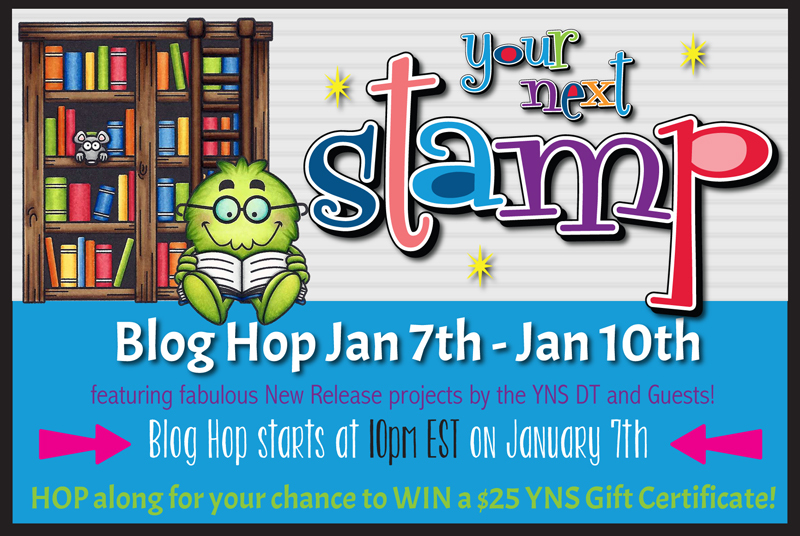 Are you ready for the January Release from Your Next Stamp? Be sure to hop along at the end of this post for a chance to win a $25 GC to the YNS Store! I'm showcasing two of the new sets.. Book Monster and Lovin' From the Oven And the new Paper Pad Hugs & Kisses. I created a watercolor background with some Distress Ink and then I die cut the panel with the Stitched rectangle Dies. I adhered it to a piece of the new Hugs & Kisses Pattern Paper that I had on a Card front. Then I stamped all the images with the Black Olive ink and colored them in with Copic Markers. I used the coordinating die cut to cut the images out and adhered all the images with some foam tape. The Shelf image is stamped in the YNS Mocha Ink. My second project features the Book Monster set and coordinating Dies. I created a bookmark with some Distress inks for a background scene. I die cut a tag from the Bookmarks Tag Large die set and then I created a stencil with the Puffy Cloud borders die and created the sky. I created a stencil for the grass with the Chunky grass border die. I stamped the image and colored it in with Copics and used the coordinating dies to cut him out. Then I adhered him to the tag and stamped the sentiment. I sealed everything up with some plastic and the Fuse tool. I added some Black Solid Devine Twine for a tassel. We also have a great Sale going on so head over to the store and stock up on all your favorites! You can start the Hop with the links below. Such a cute card and bookmark. I like the kitchen scene you created and the cute monster bookmark. Beautiful projects. I love the heart cookie pan. Oh love your table with all the cookies Holly. That bookmark is to die for. Thank you Holly for this wonderful inspiration today! I love the LOVIN FROM the OVEN set especially! Just love that bookmark. It is super cute. Such cute creations! Love your bg on the kitchen stamp and the monster is so fun! Love both of your creation! Sweet. Sweet card and bookmark! I love the baking theme so this set is right up my alley! And the book monster is so cute!!!! Thanks for the wonderful inspiration! How cute! Love the new release!! Both projects are wonderful, love your card and the fun watercolored background. Such a cute card and tag. Nice work! 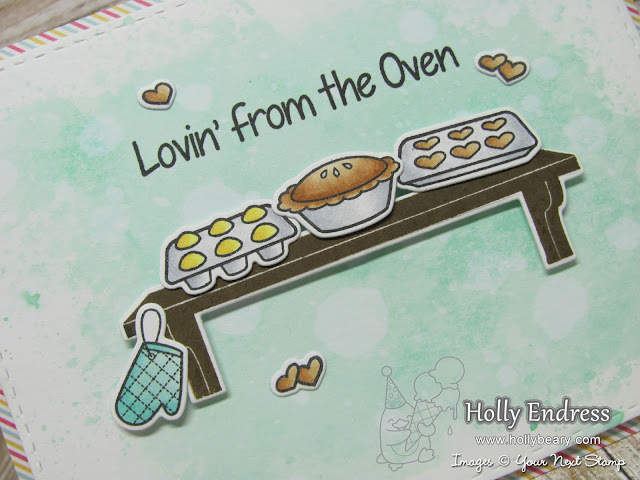 Love the Lovin from the Oven card and your watercolour background. So many great ideas! The baking stamps look so fun! Very pretty card, Holly. I can smell those yummy cookies over here. And what an adorable bookmark! Great card and bookmark. Like the idea of fusing the bookmark. What cute projects! I love the watercolour background on your Lovin from the Oven card! I've never used my inks for that. It's gorgeous! Love your card - so pretty!! And that bookmark is adorable! I enjoy baking and really like this cute new set...all the fun little elements! Oh these are so cute! Those pastries are making my mouth water! Great to promote reading whenever possible. the foodie card is cute. Loving all the images that come with this stamp set! You've laid them out so well on the card, and the foam to make it pop is just perfect. Thanks for sharing the bookmark...so so cute! I got my fuse tool a few months back, and have yet to be inspired to use it...this really makes me want to try something this week...thanks for sharing! Very cute card and love that bookmark. Super cute tag! And the card is so sweet. I love that bookmark!!! I am such a bookworm, I have to have that set!! Great idea to seal in the bookmark! Adorable card too! Your card and bookmark are delightful. Great idea to seal the bookmark in plastic. Love your ideas. The book monster is so cute. Love them, especially the card! Beautiful, I love the bookmark. Wow! Such adorable sweet creations!!! Too cute!!! I love the card, but the bookmark is too cute! Cute card and great bookmark! Great projects!! Your Book monster is super fun! Sweet creations. Love the background on your card and the monster on the bookmark. Very cute baked images and love the durable bookmark. Loving that book monster image!! Too cute! Was thinking of making some bookmarks - thank for sharing!! Love your projects! 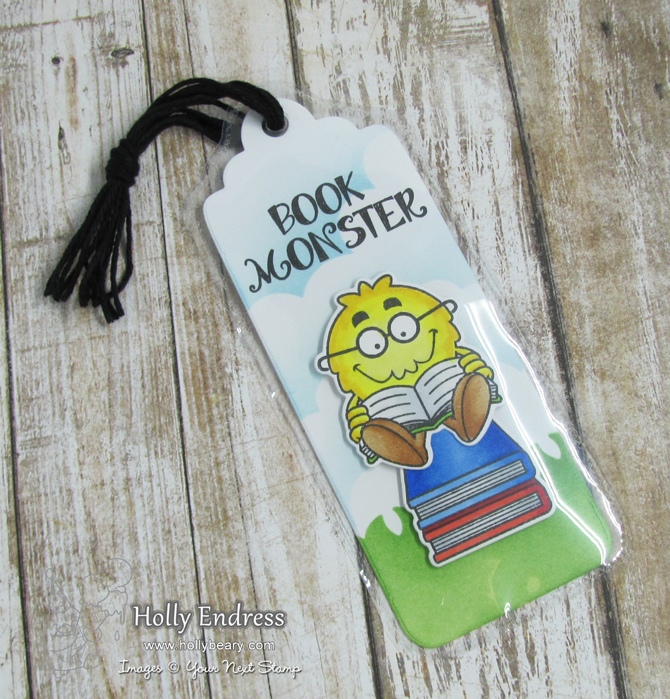 The book monster bookmark is awesome! That bookmark is so cute!!! Both projects are super sweet, Holly. Such sweet projects! Love that bookmark! Great card and bookmark, so clever. These are both adorable!! That Lovin' from the Oven set is just too cute! And I love the little scene you created. And the bookmonster??? soooo cute!! Love the cooking card . Very lovely.